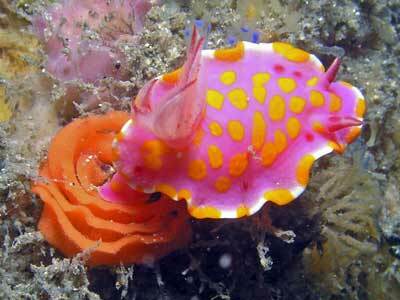 I am constantly amazed by the quality of some of the Sydney dive sites I visit. Despite hundreds of people diving them each weekend and despite having dived some of them more than 100 times, they still present a face that can astonish me. Such is Shiprock, possibly Sydney's most popular dive location in terms of the number of divers that visit per square metres of actual site. Shiprock can normally only be dived for the short period between 25 minutes before and about 30 or so minutes after the peak of high tide (you can also dive at low tide - in fact since 2000 we have sometimes had better visibility at low tide than high). At other times, the water is subjected to very strong tidal currents and very poor visibility. However, if the difference between the previous low tide and the next high tide is less than about 0.5 metre, then you can dive here anytime on the incoming tide without too much effort. Again, if the difference between the tides is little, you can go in early without too much effort. Located at the junction of Burraneer Bay and Port Hacking on Sydney's southern outskirts, the name comes, not surprisingly, from a large rock on the shore's edge which, when viewed from the water, resembles a ship. Drive to Shiprock Road at Dolans Bay and park as close to the end of the street (it is a cul-de-sac) as you can. Until September 2011 there used to be a short but steep winding path working its way down from the end of Shiprock Road. At night and in the wet, you had to be very careful when descending and ascending the path. 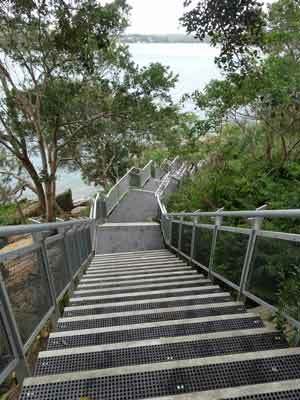 Back in about 1998 a new set of stairs was to have been constructed here by Sutherland Shire Council using funds provided by the Federal Government's Coastcare program but the Council abandoned the project. This plan was revived in early 2010 when the woman who lived in the house next door died (not sure when she actually died) and left a considerable amount of money and donated the lease of the land at the bottom of her block to the council so that stairs could be constructed and a decent area made for divers at the water's edge. Construction began in mid-September 2011. The construction was to finish by Christmas 2011 but in fact it was not complete till 3 April 2012 (really not totally finished till about July 2012). What was built defies imagination, it is the best set of stairs I have ever seen. 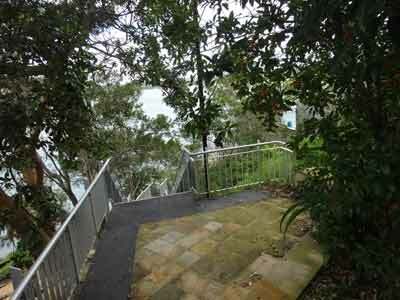 It is now a lot easier to walk down and up, although it is just as steep. No more pulling yourself up using a rope! There are a number of flat platforms on the way down, with places to rest if needed. Originally I wrote that I had concerns that the new structure with a large platform at the bottom (behind number 4 - which has number 2 on its fence) would encourage dive shops to come here more often outside high tides to do courses and thus upset the residents even more than they get now. However, this does not appear to have happened. Please, Sydney dive shops, continue this practice and do not use Shiprock as your training area, it will ruin it for all divers. There is now a gate at the top which has a sign saying it will be closed from 9:30 pm till sunrise. This was because neighbours complained that divers were drinking here after dives (rubbish, it was the local kids). There is also now a prohibition on drinking alcohol in the reserve and the street. As peak tides here are approximately 20 minutes later than at Fort Denison (Sydney Harbour) it is recommended that divers enter the water at the time that the high tide is forecast for Fort Denison and aim for a dive of about 50 to 60 minutes duration (70 minutes is easily achievable). High tide is the preferred time to dive, offering better visibility and currents which assist you. You should ensure that you get in the water exactly at the forecast peak of the tide. However, even when you abide by these rules, the tide can sometimes have its own mind and you can still get caught out. It seems that on high tides and when there are very large easterly or north-easterly seas, the change of tide is delayed, with the tide unable to overcome the large seas. Eventually the tide overcomes the seas and it changes. This delay can be between 5 and 40 minutes. On normal high tides, do not enter any earlier as you will inevitably have to swim back against a strong current. For some reason, some Sydney dive shops insist on starting their dives here about 30 minutes before the right time to enter and then wonder why their divers do not have a good time! In well over 100 dives here, the system I have outlined above has never failed me. If the high is only 1.3 metres or less, you can generally enter the water up to 15 minutes early or later and not have a problem. At low tide you can nearly always enter the water up to 15 minutes before the Fort Denison low tide. 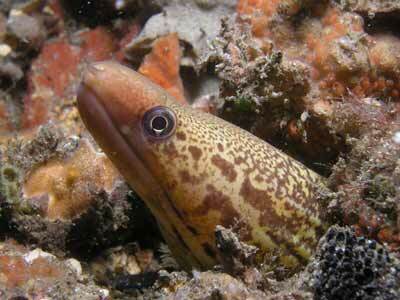 Generally you will not encounter any sort of real current on these dives. While the current will never be dangerous, it can be a bit annoying to expect the tide to be in your favour for the whole of the outwards first 20 to 25 minutes of the dive and then in your favour for the final 20 to 25 minutes return journey and find that it only assists for the first 10 minutes and then the next 10 minutes are spent fighting the tide or after you turn around it is still running in. I usually aim for 30 minutes moving away from the entry point (which gives 20 minutes assistance, then some slack) before returning on the outgoing tide. As mentioned, best bet is to enter the water at the predicted high tide. Note that sometimes the tide can be in your face fro the first 10 minutes before being behind you - this is not always the case. Visibility generally never used to be good at all, with 5 to 7 metres being average in the 1990s. However, it seems to have got better in the late 1990s and even more since the early 2000s. Since 2000 I would say that the average is more like 10 metres. I have even experienced in excess of 20 metres a couple of times. On 28 November and 15 and 16 December 2001 and 13 January 2002 I had about 10 metres although only about 7 metres on 3 February 2002 (after a fair bit of rain). On 17 February 2002 it was about 5 metres and by 20 February it was up to 7 metres. Pretty amazing considering that over the previous two weeks there had been over 300 mm of rain and on 10 February 2002 the water looked like mud. On 27 December 2002 it was about 7 metres after a fair bit of rain over the previous few days and on 4 May 2003 it was also 7 metres after quite heavy rain over the previous week. In April 2008 I dived here three times in four days and visibility varied from 5 to 12 metres, even though it was raining a lot over each day and for the week before. Just because the top looks dirty does not mean the main dive area will be dirty. See the above map of Shiprock dive site and the panoramic photograph below. Once you get to the bottom of the stairs, there are three places to enter the water. The first is the old spot behind Shiprock itself. This now has some stone steps to the water. This is probably better at very high tides as the next spot can be hard as I will explain. The second spot is in front of the rock, where the old boat ramp used to be. There are now steps here, although the bottom two are very high and also have a rubble bottom rather than concreted stone. At low or lower high tides this can be a bit harder to safely step down to. The third spot is through the pool to the right as you hit the bottom. This is good at any tide, although personally I do not enter the water here. A panoramic photo of the water's edge at Shiprock. 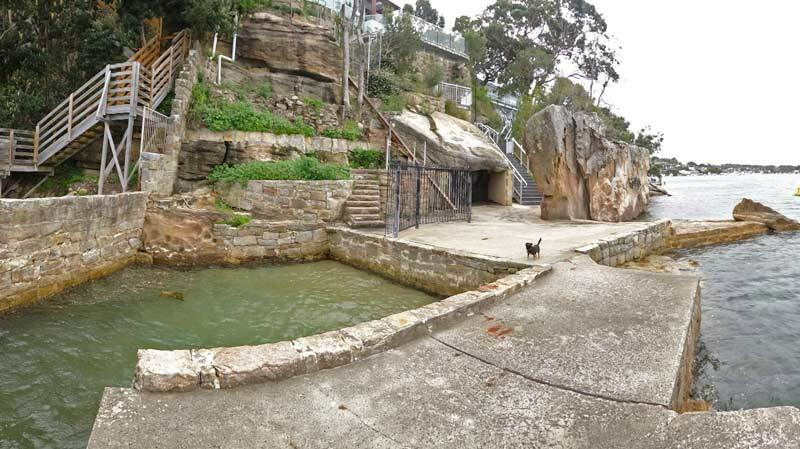 The pool is on the left, the steps to the water at the far right between the large rock and the water. After entering the water from behind the rock, wade around to the front or side of the rock before putting on your mask and fins. If you use the steps in front of the rock, you can go to the bottom step or even the bottom and then put your fins on when resting on the right side and then flop into the water. Swim out a few metres from the new steps and start your dive. The water here will only be two to three metres deep but head east and it drops to about six metres and then suddenly drops away to almost 15 metres. Extreme care should be taken on this dive to never surface if you have lost your buddy as power boats by the dozens pass here on the weekends, even straight over the top of the dive site. Despite what you may have been taught, under no circumstances should you ever surface directly from the deep part of this dive site. If you must surface, for example, to look for a lost buddy, first head to the west or the north (depending on what part of the site you are at that time) into the shallows (four metres) before coming to the surface. If lost, a good bet is to head north-west and you will eventually find the wall and the shallows. Once you drop over the wall, head south, keeping the wall to your right. 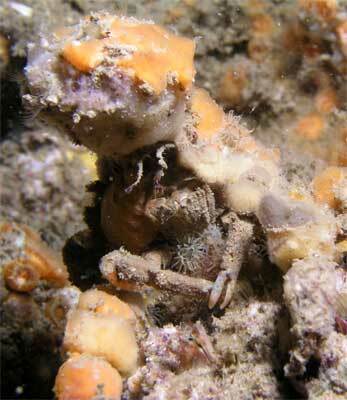 About 20 metres along a small bubble cave is located at a depth of 15 metres. It is worth examining, even though you can only put your head out of the water. Further along there are a number of very large rocks which are a few metres off the wall. These may not be readily visible in time of poor visibility, so swim out five metres or so every now and then. These rocks are well covered with growth and attract large numbers of fish, especially leatherjackets (all types). 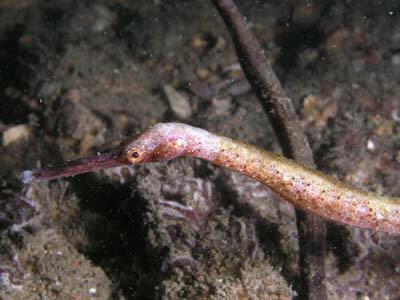 There are also sometimes sea horses. On my dives here, I go straight out to the bommies and do them before coming back to near the wall. If you do this, there is a small bommie, then a larger one and then a very large one. Each of these is about 10 metres apart and located south from the previous one. The largest one, the third, is the last this fair off the wall. 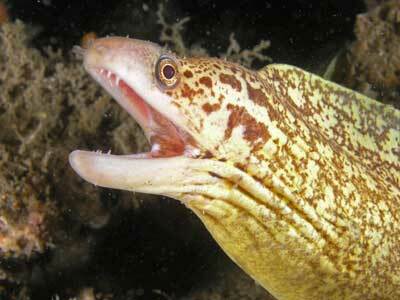 This one has a moray eel normally on the south-western side. From this bommie, the next ones are much closer to the wall. If you head west, you will strike either of two bommies. The one to the south contains a plaque in the memory of a past president of the Underwater Research Group, Howard L Couch. He died in 1968. I regularly clean the plaque, the least I can do for someone who was obviously well thought of by his fellow members. 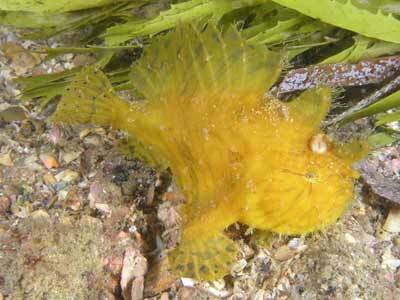 The area around the bommies also support some rarer fish, including the strange looking anglerfish. The sand can drop down to 18 metres around the base of the rocks and there is usually something worth seeing out there, including red indianfish. 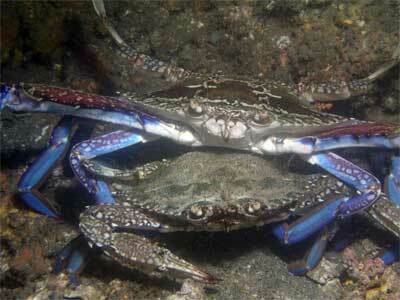 You may also see blue swimmer crabs in this area. 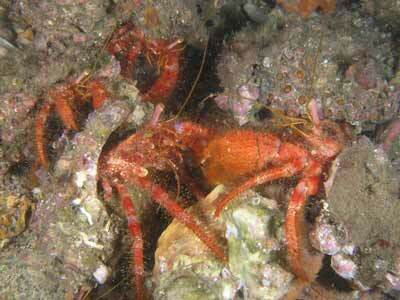 In November and December they may be mating (you can see up to five pairs on one dive). 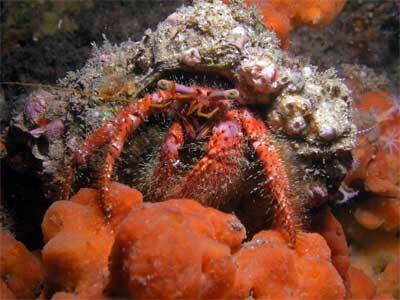 I usually head out to the dive along the wall until I come to the rocks and then go out to them. After going around each of them, I run parallel to the wall (about five metres off it) with some ocassional returns to the wall. The abundant overhangs along the wall are home to estuary catfish, cuttlefish, decorator crabs, spider crabs, moray and conger eels amongst other things. 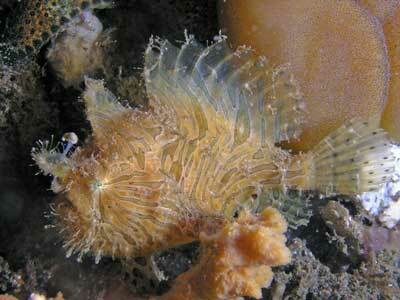 In April 2008 I found a tiny, 15 mm long Whites sea horse. This was bright yellow and really stood out, despite its small size. Just past the last large rock off the wall there is (as of December 2008) a large wharf pile that has been dropped here by a slack contractor. It is painted white on the top, has lots of growth on the middle section and is clean where it was in the sand. It has moved a bit since then, the last time I saw it, it was about 20 metres off the wall and a bit east from where it was originally. 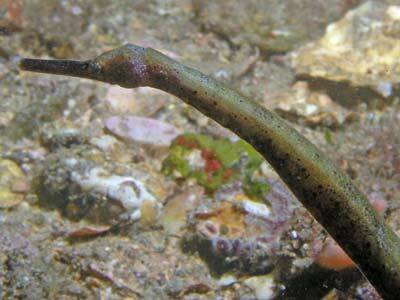 In this area from ealy 2008 till late 2008 there were at least three pipefish. 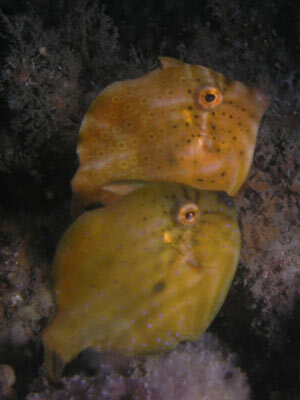 They could be seen on most dives, but as of December 2008 they could not be seen. 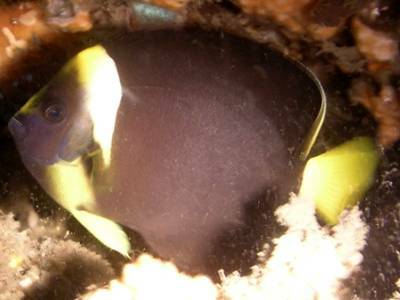 However, in 2009 two were able to be found on most dives. They still can be seen in May 2010. Just past here you will come across a large truck tyre. 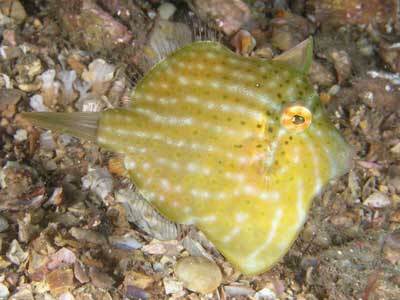 Prior to November 2001 I had also seen three rare pineapplefish (knightfish) in one small overhang about five metres past the tyre. This was three times the number of these I have seen before at any one location. 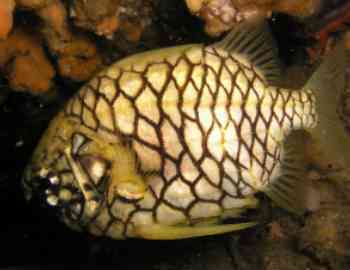 See later about pineapplefish. 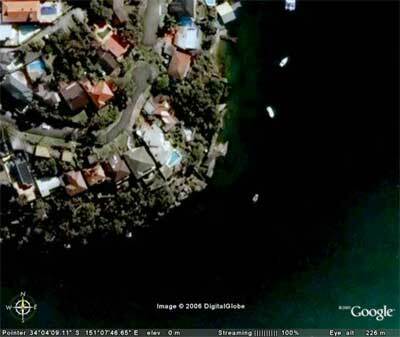 as being a "rarely encountered species"
On 15 February 2007 we saw a large female green turtle in this area. It had a lot of growth on its flippers, tail, head and shell. Some of this was mussels, barnacles and algae. A little further along are the remains of a stump of a very large tree about two metres off the wall. 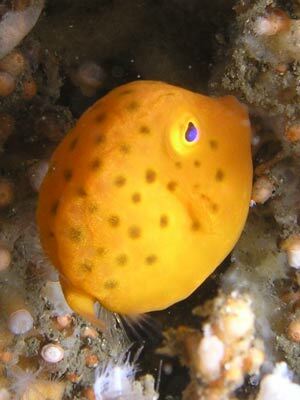 In November 2001 I saw six pineapplefish all together in one overhang about 15 metres past the stump (this is near the end of the wall) and two more closer to the stump. Eight on the one dive!! 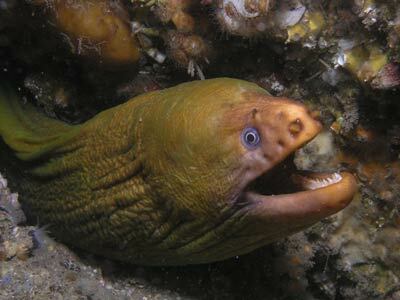 Then, on 15 December 2001 I saw one, then seven and then three giving a total of 11 on the one dive. The next day I saw the seven again as well as three more near the start of the dive. In January 2002 I saw eight and on 3 February 2002 a total of seven. 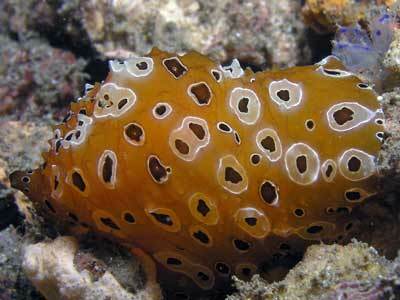 These are the same seven mentioned on dives above. 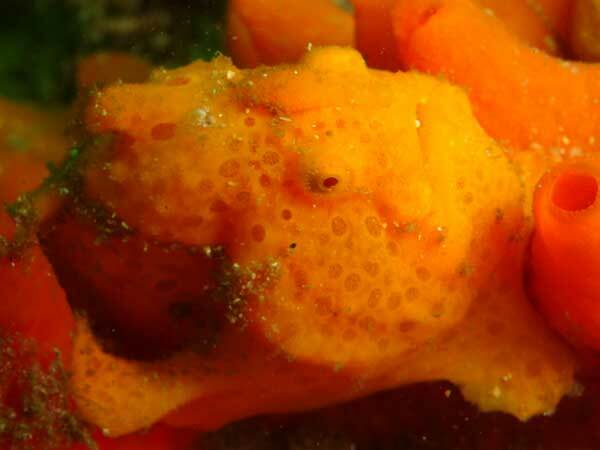 On 17 February 2002 I only saw one here but on 20 February I saw five under the bubble cave (see later) and I thought that they were probably part of the seven seen before. However, on 12 May 2002 I saw seven in the location past the stump, two just past the stump, two just past the tyre (small ones) and six under the bubble cave. A total of 17 on the one dive!!! On 29 May 2002 the two small ones were in the same place as were the six at the bubble cave but on 9 June there was only one of the two present. There were also six at the end of the wall (instead of the seven seen before) and on 9 June only four here. On that date I saw another four shallower back towards the entry point (that is, near the top of the main wall) and six at the cave. Again, 17 on the one dive, at least four of which were different to ones seen before. On 29 June 2002 I saw 30. These things are breeding like rabbits! On 4 May 2003 I saw 19, seven at the end of the wall, three above in a different overhang, seven below the exit and two elsewhere. Of note is the fact that the two I have seen on nearly every dive (near the tyre) were not seen nor were the ones under the bubble cave. On 28 September 2003 I only saw two, both below the wall near entry point. On 12 and 15 January 2006 and 15 February 2007 I saw none. 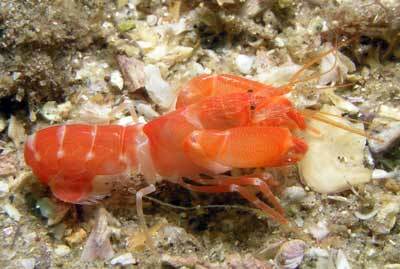 I saw none till December 2008 when a solitary one was seen on two dives. What has happened to them? Since this time there have been two in this spot. The wall turns towards the west and becomes less prominent and then in spots is just a pile of rocks. It gradually becomes shallower (8 metres) and appears less interesting and you may see some moorings. However, this is really a great part of the dive. Keep going till you see a huge tree trunk lying parallel to the wall. It is adjacent to here that I saw a lot of the pineapplefish. A bit further on you will see a floating wharf above you. Another 20 metres brings you to another wharf and four large wooden piles (and one on the sand) which used to contain a large powerboat. I turn around here (normally 30 minutes into dive). By this time, if you are diving high tide, the current will start to run outwards and assist your return to the exit point. Under the boat you used to find huge schools of large bream, luderick and other species (the boat has not been there since at least 2004). From here I keep to the top of the wall for 50 to 75 metres before dropping over the wall to the bottom. 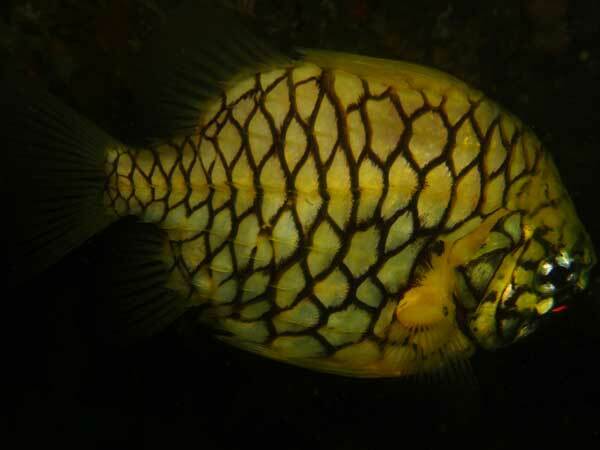 Look in the shallows and you will be amazed by the fishlife. Along the wall look for spider crabs, decorator crabs and firefish. Keep going right along the wall and in every nook and cranny. The best exit point is the pool. This can be found by taking the slope up after you have passed the bubble cave and then turning back to the south and following the top of the wall till there is only a very narrow strip of sand to your right. Turn at right angles to the right and you should see the entrance to the pool. 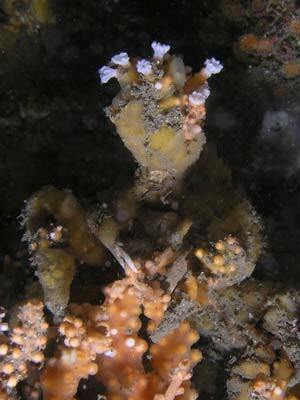 On 16 February 2007 we found a small (75 mm) harlequin ghost pipefish in this shallow area, my first in Sydney. Fantastic! When finishing your dive, take some time to examine the rocks and kelp near the top of the wall as you can often find sea horses and red Indianfish in this area. We often see huge schools of over one hundred large sand whiting in this area. There are other species of whiting in this area as well. The amount of fishlife to be found here is simply amazing for such a small and well used area. There are more leatherjackets than at a Hells Angels' convention! 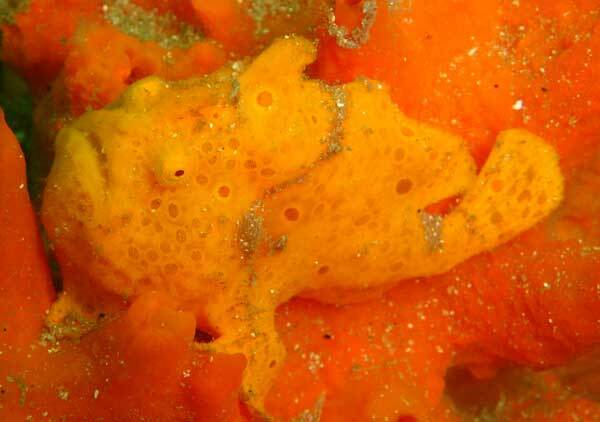 Sponges, sea squirts, ascidians and sea anemones can be seen everywhere and the fish thrive. Fish to be seen include common stingaree, conger eel, moray eel, serpent eel, eastern fortesque, bream, mado, estuary catfish, eastern smooth boxfish, many species of leatherjacket, red morwong, magpie morwong, silver sweep, sand whiting, John Dory, blue trevally, stripey, old wife, white ear, blue swimmer crabs, spider crabs, decorator crabs, hermit crabs, smooth flutemouth, flathead and heaps of different species of nudibranch. You often see large kingfish swimming by. This site is home to many tropical species. 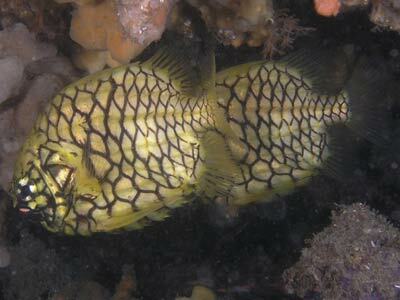 I have seen moon wrasse, a juvenile painted sweetlip here as well as many times different species of butterflyfish. In January 2002 I saw two parrotfish (not sure what sort) and in August 2011 we saw what appeared to be a green-finned parrotfish in the shallows. 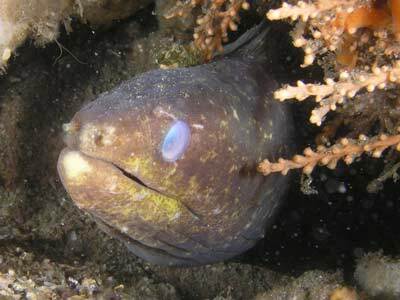 In January 2002 I also saw one fish that I think is a blackstripe blenny, normally found in sheltered spots on coral reefs in New Gunea. 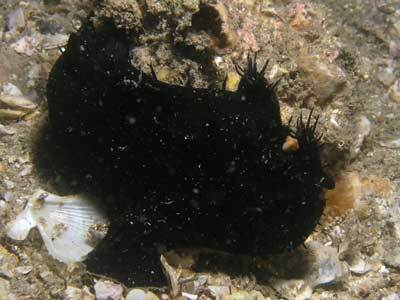 I have also seen estuary rock cod, another tropical species. In 2000 I saw two small ones and a large one in February 2002. Shiprock is an aquatic reserve and as such all fishlife is protected. On 4 April 2012 we saw two parrotfish here, one just a few metres from the entrance spot. Shiprock is an excellent night dive, although as indicated above, care must be taken to ensure the right time is selected to start your dive. As this is a very quiet residential area, please respect the residents' rights, especially at night or early in the morning and keep your noise to a minimum. On weekends (especially when seas are up outside), and if the high tide is after about 9 am, parking in this area is at a premium due to Shiprock and the nearby Dolans Bay wharf. It is recommended that you arrive early to get a legal parking spot. This means about an hour before high tide. 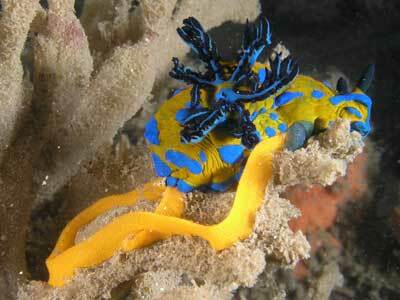 In summary, one of the best dive sites in New South Wales, simply amazing considering its location. Worth doing time and time again. I have now done it more than 120 times and I never tire of it. Time lapse photography from 5 May 2012 using GoPro.